We have a lot of requests from the users who would like to try our Hire testers program and hire Ubertesters. For our clients to understand how the program works and what is behind the ‘Testing process’, we created a short infographic. It shows the transparency and clearness of the process of hiring testers and receiving the feedback from them. Look through the main stages you will pass and the approximate timeframes if you decide to test your app with Ubertesters. 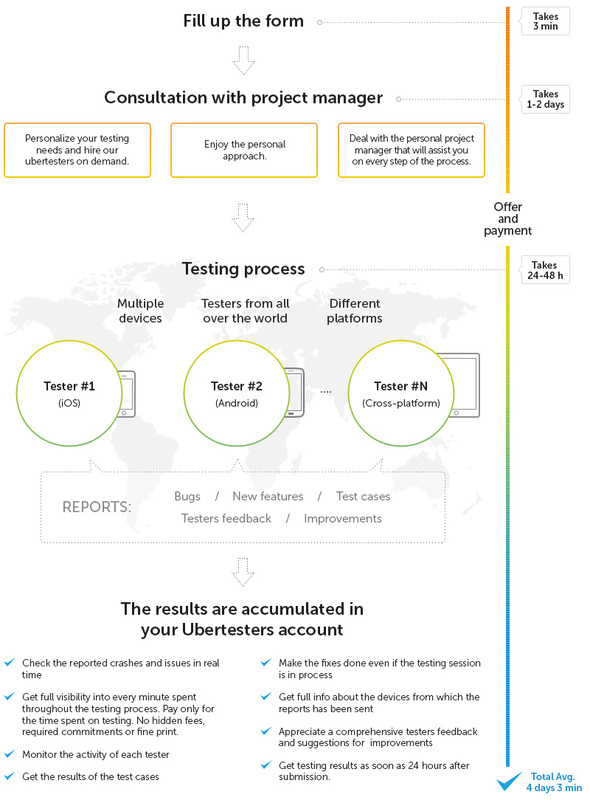 Let’s take a look at each stage of hiring testers with Ubertesters. Fill up the short form here providing the basic information about your project and organization, write how many users you need and provide the details of your project. Our project manager will get in touch with you over phone or email to clarify any remaining issues. You will also discuss the number of qa testers , required mobile devices and their operating systems, deadlines, test plan and any other special requirements that you may have. When the arrangements are done, we’ll send you an offer and will be ready to start when the payment is completed. Our professional qa testers will start the testing process. They will search through your app on their devices finding bugs, pointing out the drawbacks and offering some improvements. They will execute the provided test cases and send the reports. During the testing process, you can monitor the tester’s activity in your account – you’ll check the time the session remained active, the device info and the session tracking there. The results are accumulated in your Ubertesters account. Once the testing process is over, you can check all the reported issues and crashes to make the conclusions. However, the results are available in the real time – so you can fix bugs even the testers’s job has not been finished yet. Hire Testers program gives you a chance to test your app globally. Our professional qa testers will handle the testing process smoothly and effective. Get the results faster and cheaper with Ubertesters bug submission tool. Try Hire Testers program now and compare it with your previous experience. Start now to get the results as soon as in 4 days! Mary is a customer support specialist at Ubertesters. New OS version – How to Make Your App Ready?